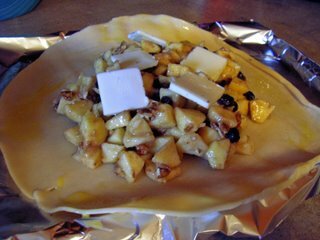 Line a baking sheet with tin foil, spray it with Pam and unroll your pie crust on that. Mix the rest of the ingredients in a bowl (except the butter) and spoon onto the crust. Put the butter slices on top. Bring the sides up together as close as you can. I did use an egg wash because I wanted the crust to stick together, but I imagine a little water would do the same thing. Then I brushed the rest of the pie with the egg wash.
Cook in a 350 degree F oven for about an hour or until the crust is browned nicely. Man! Was this sucker good! DH is already begging me for another. I think I want to make something chocolate next though. Anyway, this couldn’t be easier. I hope you give it a try. Sorry I don't have an image of the finished product. In an effort to try and take better pictures, I turned off the flash and just tried using natural light. Therefore the picture didn't come out as it was dark by the time we ate it. Some day I'm going to learn how to use this camera! You made the apple crostata ... I'm so excited! It looks terrific! And I bet it did taste amazing! I'm so jealous that you can get those ready-made pastry sheets. We have ready-made crusts (in the actual tin), but no sheets. Congratulations ... you are becoming a brilliant baker! They're made by Pillsbury and I'm surprised you can't get them in Canada. Look in the freezer section by the rolls. I'll be you can get them there. As with everything, practice makes perfect. I get so frustrated with crusts, tho. I think I "mess" with it too much. It always turns out tough (if I can even get it to the pie pan!). Thanks for the comment, Ivonne.